Learning how to hit solid fairway wood shots is not difficult. Fairway woods are versatile clubs that help you cover long distances on the golf course. Sometimes, you need to hit a long shot over a hazard or to reach a long, tough par 4 in two strokes--or even to hit a par 5 in two and have the exciting opportunity for an eagle. Becoming proficient at hitting fairway woods can help players who are shooting in the 90's to bring their scores into the 80's. Just as when you are hitting a driver, your stance with a fairway wood should be wider than what you use when hitting your irons. You want to approach the ball at a more level angle with a fairway wood than you do with your driver, so move the ball back in your stance. 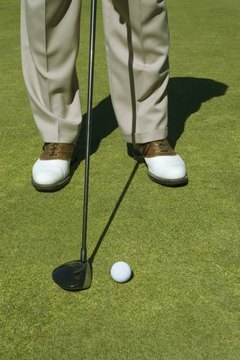 If you are a right-handed golfer, the ball should be 4 inches inside your left heel. The mental image you want for fairway wood shots is that you are sweeping through the ball, not striking down on it as you do with your iron shots. Make a more rounded, or less upright, swing--which is encouraged by your wider stance. Resist the tendency to overswing, or hurry your swing, in order to generate more clubhead speed and power. Full extension and good tempo will give you all the power you need. You might even deliberately swing with less than your normal speed to make sure you keep your rhythm and balance throughout the swing. Many amateurs, even those who shoot regularly in the 80’s, have difficulty with long irons--the 2-iron and 3-iron in particular. Consider replacing these troublesome clubs with a 7-wood and a 9-wood. Lofted woods are easier to hit, can give you plenty of distance, and will make you more confident when you step up to the ball. If you find that a 3-wood is a difficult club for you to hit off the fairway, use a 3- or 4-wood instead to get the ball airborne faster. Higher-lofted woods are efficient tools to get your ball out of the rough. These clubs have a lower center of gravity, and when combined with a higher loft than long irons, can help you make more solid contact with the ball. Move the ball back in your stance somewhat and envision a swing with a more descending blow, rather than the sweeping motion you use from good lies in the fairway. Higher handicap players lose many strokes from errant tee shots that end up in the trees or rough, or are topped or popped up. The driver is one of the most intimidating clubs in the bag, particularly because many amateurs swing too violently with the driver in an attempt to gain more distance. Renowned instructor Butch Harmon, who teaches many PGA Tour pros, recommends in the book “Breaking 100, 90, 80” that players struggling with the driver should switch to a fairway wood off the tee--a 3-wood or 4-wood. The higher loft helps them get their tee shots up in the air more quickly and more accurately. Staying out of trouble off the tee is one of the most important keys to game improvement for higher handicap players.